Here it is, the gift guide for all the ladies in your life! All these items are things I already have or that are on my personal wish list. I was really hoping to snag a Letterfolk (#1) during the Black Friday sale, but my fingers weren't nearly quick enough for that. And their restocks are selling out quickly. Check their website for the next one! I'm in love with them all! The grey, the white, the classic black... how to choose?! While I'm waiting, I'll work on my wit... because that first letterfolk phrase needs to be epic! I also want a camera strap; and #2 is Conor approved, meaning he will rock it too! The homesick candle is such a thoughtful gift for anyone missing home. One of my sweet friends gave me one for my birthday. The cosmetic bag (#4) is a splurge, yet beautiful. I've always wanted a pearl ring (#5) but have had a hard time finding a simple one that I loved. This one caught my eye immediately when I saw it in the Nordies catalog. And finally, you can never ever go wrong with a MAC eyeshadow palette (#6). My mom gave me one last year, and I still use it daily! I still have a few ladies left on my list. I love putting lots of thought into each one, so often I am left scrambling at the end. The pressure is on! Those all sound great- what a thoughtful candle! 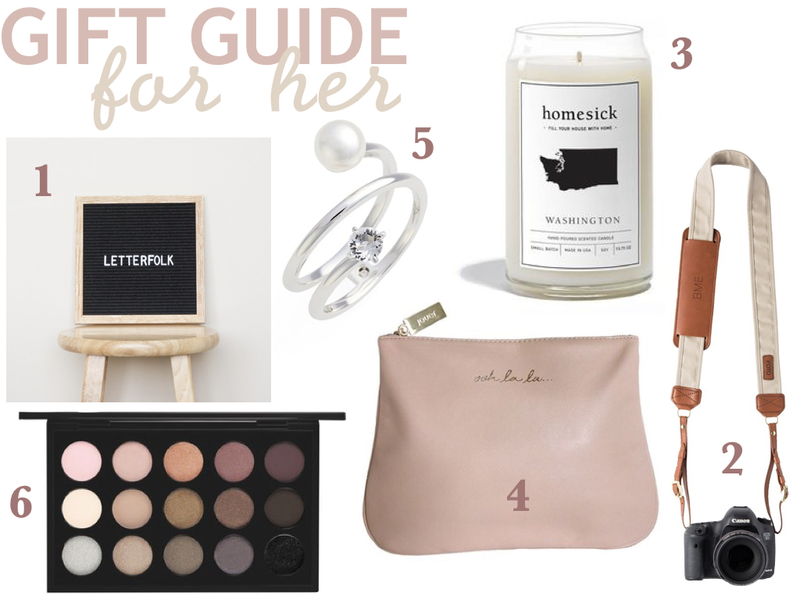 I including the Homesick Candles on one of my gift guides as well. I think they're such a cool idea! I love that MAC eye shadow palette! Also, I have seen those Homesick Candles quite a few places and am so tempted to buy one for myself just to see what my home state "smells" like! Love my letter folk board..it's such a good gift idea! This is a great list! Everything is so lovely. I need to hire you to do all of my holiday shopping because I'm the worst gift giver! So not my spiritual gift. oh that homesick candle!! i love it. i wonder if they have one for me lol. and now i want a Letterfolk. i had seen them but didn't know you could like, buy them. so thanks for that haha. Give me all the things!! Do lenses count as stocking stuffers?! I have a homesick candle on my list!! And, a Letterfolk would be so amazing! I want a Letterfolk SO bad! I tried to get one last Wednesday, but they sold out so quickly!! Ah, great list as always. I'm thinking about replacing our camera strap too, those are so nice. Totally ordered a homesick candle for my sister in TX and SIL in Germany, those will be perfect/unique little gifts, thanks!! Yes to all of these!!! I'm just going to forward this post to my husband! I hope you can get your hands on a Letterfolk soon! I scored one on the Monday after Black Friday and it shipped faster than Erin's from Black Friday. Score! Keep checking for re-stocks and get those fingers ready!